In an apparent reference to the USD 50 billion CPEC project, Swaraj said all connectivity initiatives must be based on the principles of respect for sovereignty and territorial integrity. DUSHANBE: External Affairs Minister Sushma Swaraj on Friday urged the SCO members including Pakistan to assume their national responsibility and cooperate with each other, saying terrorism remains the most overwhelming threat to development and prosperity. In an apparent reference to the USD 50 billion China-Pakistan Economic Corridor (CPEC), Swaraj said that all connectivity initiatives must be based on the principles of respect for sovereignty and territorial integrity, consultations, good governance, transparency, viability and sustainability. India has opposed the CPEC projects and protested to China as it is being laid through Pakistan-occupied Kashmir. Swaraj, who is in Tajikistan's capital to attend a two-day conclave of the Shanghai Cooperation Organisation (SCO)'s Council of Heads of Government (CHG), said: "terrorism remains the most overwhelming threat to our common goals of development and prosperity". As the footprint of terrorism expands, governments must assume their national responsibility and cooperate with each other, she said in the presence of Pakistan's Foreign Minister Shah Mahmood Qureshi. "We have all benefited from globalisation. We must further develop our trade and investment cooperation. We support an open, stable international trade regime based on centrality of the World Trade Organization," Swaraj said. India has actively supported the SCO Qingdao Summit Leaders' "Appeal to Youth" against radicalisation of youth, she said and congratulated all her colleagues on the successful completion of the 'SCO Peace Mission 2018'. It was the first time that India participated in these counter-terrorism exercises. 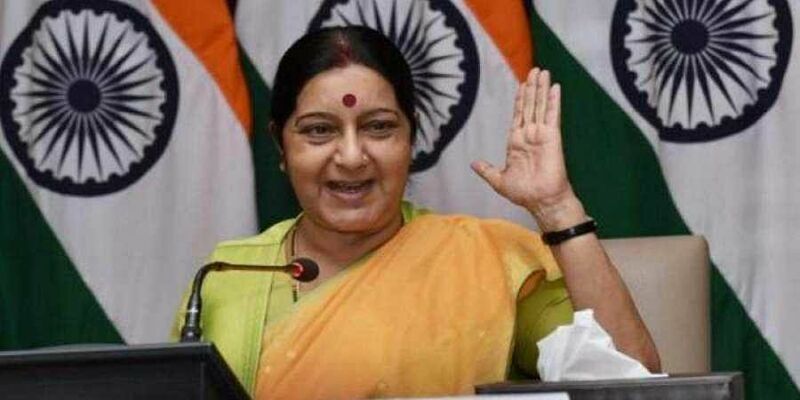 India stands committed to a peace process which is Afghan-led, Afghan-owned and Afghan-controlled, that can help Afghanistan emerge as a peaceful, secure, stable, inclusive and economically vibrant nation, Swaraj said. "In this context, we welcome the signing of the Protocol of the SCO-Afghanistan Contact Group on the sidelines of the Qingdao Summit. We would be happy to co-host with Afghanistan, the next meeting of the SCO-Afghanistan Contact Group in India," she said. India is determined to work together in the SCO on environmentally friendly energy alternatives to ensure sustainable development, Swaraj said. "India shares the desire of the SCO members for enhanced connectivity. All connectivity initiatives must be based on the principles of respect for sovereignty and territorial integrity, consultations, good governance, transparency, viability and sustainability," she said. "I am happy to note that SCO has taken a positive step in this direction by organising the first meeting of the Heads of Railways of the SCO Member States last month," she added. India became a full member of the China-dominated grouping last year and New Delhi's entry into it is expected to increase the bloc's heft in regional geo-politics and trade negotiations besides giving it a pan-Asian hue. India and Pakistan became its members last year. The bloc currently has eight member countries which represent around 42 per cent of the world's population and 20 per cent of the global GDP. Prime Minister Narendra Modi led an official delegation to the SCO Summit in Chinese city of Qingdao in June.